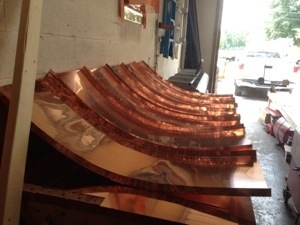 These standing seam copper accent roofs were completed last week. To start the job I made a pattern of the curve or radius of the roofs and drew that same curve on my shop floor. I made up the panels on an ingenious tool called a shrinker, the shrinker gathers the metal in the upstanding panel seams and causes the panel to curve. Working slowly I develop a curve in the standing seam panels to match the line on the shop floor. The installation of the curved standing seam copper roofing was done pretty quickly because the panels were prefabricated in the shop (I did them after hours over three nights). When the curved radius panels are installed on the roof they’re seamed to their adjoining neighbor with a double lock seam; this means that the standing seams are folded over twice to form a waterproof joint that requires no sealant or caulk. 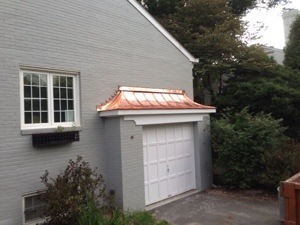 The method we used to install this standing seam curved copper roof has been relatively unchanged for 200 years. Using these traditional methods to install copper roofs gives a certain tranquility of scale that I feel is lacking in modern metal roofing. 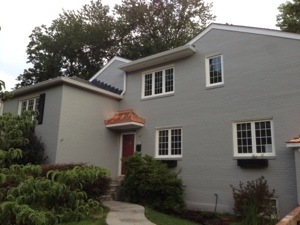 Metal roofing in northern virginia is seen on copper bay window roofs as well.